Oct. 15, 2014 11:00 p.m. The Bus Co-op is believed to be the first program of its kind in North America by its creators. Officially launched Wednesday, three Langley seniorsâ€™ agencies have come together, with the help of Vancity and TransLink, to create an affordable bus-sharing program for seniors. Langley Seniors Resource Society (LSRS), Langley Care Society, and Magnolia Gardens founded The Bus Co-op. Members of the agencies, including Janice McTaggart of LSRS and local dignitaries were on hand for the reveal of the bus contributed by the seniors centre. TransLink will also be providing a bus. â€œWe know first-hand that owning and maintaining a bus can be a huge burden for seniors agencies so why not share our resources? The co-operative model really appealed to us because it is democratic, values-driven and very connected to the community,â€ McTaggart said. 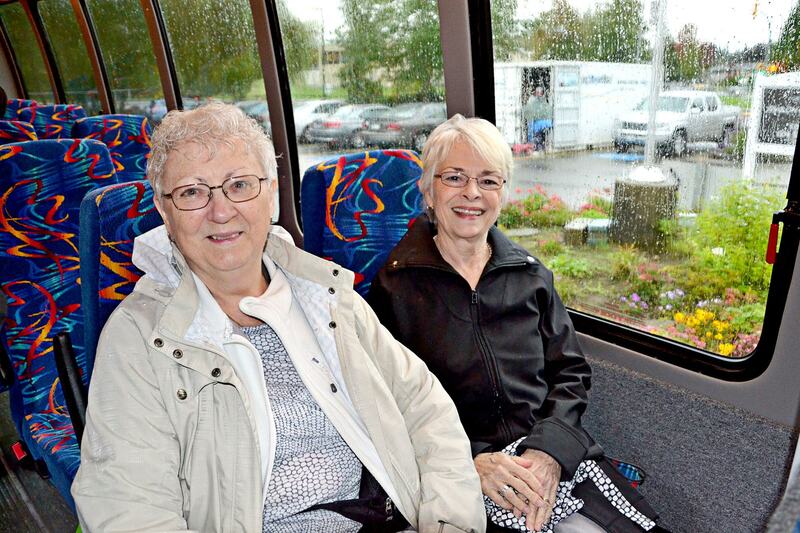 With seniors making up approximately 14 per cent of Langleyâ€™s population, and that number growing, the new co-op allows seniorsâ€™ agencies to become a member of The Bus Co-op, book a bus, take a trip, and return the bus. All fuel, insurance and maintenance are covered by the co-op with groups paying just $40 an hour to use the bus. Member groups supply their own qualified driver. The co-op has two buses and is looking for other seniorsâ€™ agencies in the Langleys to become members. There may be expansion of the program into Surrey and White Rock in the future. Vancity provided over $165,000 in grants and financing for the program. Andy Broderick, vice-president of community investment with the credit union was at the launch event. Broderick noted the fact that the new program is a co-operative made it particularly appealing to Vancity. CLARIFICATION: TransLink was asked for a bus for this innovative program. &quot;From time to time, we are approached to provide a decommissioned bus to a charity or non-profit organization. In this case, we have arranged for an â€˜end of serviceâ€™ HandyDart bus to be donated to this group in November. &nbsp;The bus referred to in the news story is not a TransLink vehicle,&quot; explained&nbsp; Cheryl Ziola, TransLink Media Relations manager. Seeing sharing as an age-old, and valuable, concept was the message Langley Township Mayor Jack Froese conveyed. This new program enables seniorsâ€™ agencies to ensure Langley seniors have more opportunities to be active.